UPDATED: Sat., Dec. 16, 2017, 10:41 p.m. The Fighting Hawks certainly live up to their name. Even against the No. 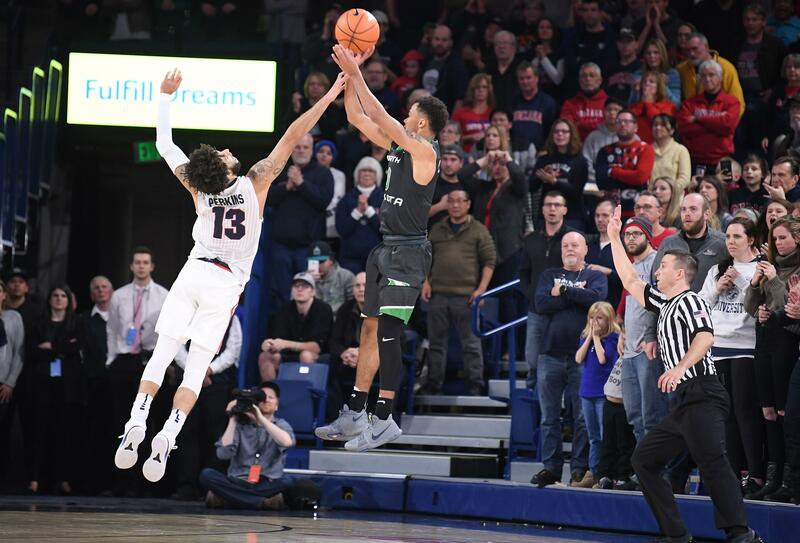 12 Gonzaga Bulldogs, North Dakota was not easily contained on Saturday when the Zags finally put away the Hawks in overtime with an 89-83 win. It was a brawl that caught the Zags off guard from a team with only four wins this season. After trailing for the majority of the game, the Bulldogs (9-2) went on a 14-2 run to take a three-point lead over North Dakota (4-7) with 15 seconds remaining. But the Hawks had a little left in the tank. The guards kept their distance, trying to find a good look from 3-point range. Geno Crandall got a feed from Cortez Seales near the top of the arc and drained a 3-pointer with 1 second left, sending the game to overtime. The Hawks tried to keep a tight grip on Gonzaga, but they didn’t score until Crandall hit a 3-pointer nearly 3 minutes into overtime. The 11-0 rally on Gonzaga’s end put the game into a battle of free throws, and eventually drew out all of North Dakota’s hope for an upset. But it wasn’t a loss in Brian Jones’ book. North Dakota’s biggest crutch appeared to be its depth. The Hawks had their five starters play for the majority of the game. Jones left Crandall in for the entire 45 minutes and sat Seales for only a minute of the game. He turned to four players on his bench to take over at various times, but the bench combined for only 20 minutes. The Hawks were limited, but they weren’t intimidated by the Zags, who work a deep rotation but still struggled to contain North Dakota on offense. The Zags consistently pulled their bigs out to cover North Dakota guards, leaving some easier matchups inside that gave the Hawks some easy targets in the paint. “We wanted to drive it in there and then pitch it out for open shots or drive it again,” Jones said. Throughout the game, the Hawks broke down the middle of the key for some big shots to piled up to 32 points in the paint. In the first half, North Dakota relied mostly on Seales to execute the inside shots. The 6-foot-4 junior guard broke through and hit four consecutive baskets inside to give the Hawks an 18-15 lead. Seales was nearly perfect midway through the game, shooting 7 for 8 for a game-high 14 points at the half. He finished with 23 points, most from close range. Crandall, who had four points and one field goal in the first half, found a rhythm later in the game that threatened the Zags. He finished with a game-high 28 points, including four 3s, and five assists. It was a close call for the Zags, who have dropped one game in 40 showings against Big Sky Conference opponents under head coach Mark Few. Saturday was also an end to a weeklong break for the Zags, who took some time away from the court to focus on finals. That wasn’t the case for the Hawks, who had to play on the road at South Dakota State during finals week. Despite what could have been bad timing for both sides, Jones was happy to have taken on one of the nation’s top teams to better prepare the Hawks, who have dropped four straight, for conference play in a couple of weeks. Published: Dec. 16, 2017, 10:33 p.m. Updated: Dec. 16, 2017, 10:41 p.m.